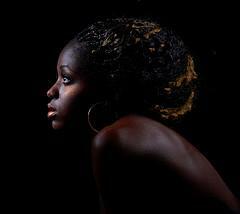 Get a great glow for dark skin with makeup. If a fresh, dewy complexion is important to you, makeup that makes dark skin glow can give your skin the iridescent quality you're after. Before you apply makeup that makes dark skin glow, you need to prep first. Good skin is the best foundation. You should practice a regular skincare routine that works with your particular skin type. You should also follow a healthy eating plan and drink plenty of water. Great complexions begin on the inside. The more you take care of what goes into your body, the less makeup you'll have to apply to achieve a glowing look. After your skin is cleansed, apply a moisturizer--yes, even if you have oily skin. Moisturizer helps your makeup go on evenly. Your skin tone may range from olive to chocolate and be considered "dark." There are makeup colors that will flatter any complexion; the trick is choosing which ones are made just for you. You'll likely find a full range of cosmetic colors in nearly every major brand, from mainstream names that cater to all ethnic groups to lines geared toward women of color. The following colors are great for African American skin tones as well as Indian or Hispanic complexions that are tan or darker. Bronze is an equal opportunity glowing color. It works for eye shadow, blush and allover bronzers. Bronze is a strong color and should be applied to one area. If you wear it as an eye color, sweep it across your eyelids and almost up to your brows, adding a touch of lighter shadow beneath your eyebrow's arch as a highlighter. If you wear bronze as a cheek color, use a fluffy blush brush to place it on the apples of your cheeks. The darker your skin, the more bronze will contrast with your complexion, making it perfect for nighttime looks. Gold is another color that will add a healthy glow to your skin. If your complexion is more olive or tan, gold will provide a subtle glow. Very dark skin will enjoy a dramatic look from gold powders. Some women with darker skin feel that pink isn't an option in makeup colors for them, but this is outdated advice. Just make sure you choose the pink that flatters your skin tone best. Women with warm undertones should choose pinks that have flecks of orange or gold in them, or pinks that are yellow-based. Women with cool complexions will look best in pink that contains undertones of blue or purple. The good thing is that pink is a versatile color. It ranges from pale to deep, so there is a pink out there for everyone. Tan skins look good in rosy pinks, while deep, dark complexions can wear colors such as fuchsia that might overwhelm lighter skin. Peach is a pretty, subtle color that brings tan skin to life. It works on eyes, cheeks and lips. You can wear it all over for a natural look. Top a pretty peach lipstick with clear gloss for a shiny, inviting lip look. When choosing makeup to give your skin a healthy glow, mineral makeup often has the soft, iridescent qualities you're looking for. You can choose mineral foundations, blush or loose powders. Shop for makeup that bills itself as iridescent. For some cosmetic brands, the word to look for might be "pearlescent." For others, it could be "shimmer" or "sparkle." Just skip the matte makeup, which is designed to look flat, if you're after a glowing look. Makeup that makes your skin glow can be subtle or dramatic. For daytime, choose one feature to highlight, but make sure it's suitable for work. Anything too glossy or shiny should be saved for nighttime. At night, you can choose those deep colors and heavier applications that are too much for day. If nothing else, dip a fluffy makeup brush into a loose mineral powder and apply it all over your face. This gives your skin a beautiful glow all by itself.